In youth basketball, there are few things that are more important than building fundamental skills, which include both technical skills and general sportsmanship skills like decision-making and leadership. Games are great for teaching kids how to handle both triumph and defeat, but practices are where most of the work actually happens. This is why you need to make sure you make the most out of each practice. In order for you to really maximize the time you have, a few things need to happen: the players need to be alert, focused and engaged, drills need to be skill and age-level appropriate, the atmosphere needs to be safe and based on positive and/or constructive feedback, and there should be a scrimmage to allow the players to integrate the specific things they’ve learned during the practice. Below, we discuss the 10 ways you can get the most from your practices. Holding a practice without first creating a plan is a mistake. It’s best to prepare a loosely-structured practice plan in advance. This will give you a good sense of how to run the practice and allow for any last minute changes due to unexpected things like absences. Kids do better with structure, as there’s less time for goofing around. Dynamic warm ups are imperative for players of all ages, and particularly for older, more advanced players. These types of warm ups help to prevent injuries from overuse or strain by warming up the body as a whole. It’s important not to overlook the power of warming up, and the gains that can come from it: speed, agility, coordination, power, control, and readiness are all improved upon by warming up in this way. Because basketball especially relies on these skills so heavily, it’s an even more important step to take. Dynamic warm ups are different from static stretches, and should last for at least 5-7 minutes — longer if the players are older and more advanced. Some examples of dynamic warm up exercises are jogging, jumping rope, sliding, backpedaling, jumping, walking lunges, side stepping, landing, and practicing quick stops and starts. Make sure you are dedicating enough time to this crucial step. Utilizing drill work should take up most of the practice time, from beginner levels to advanced. 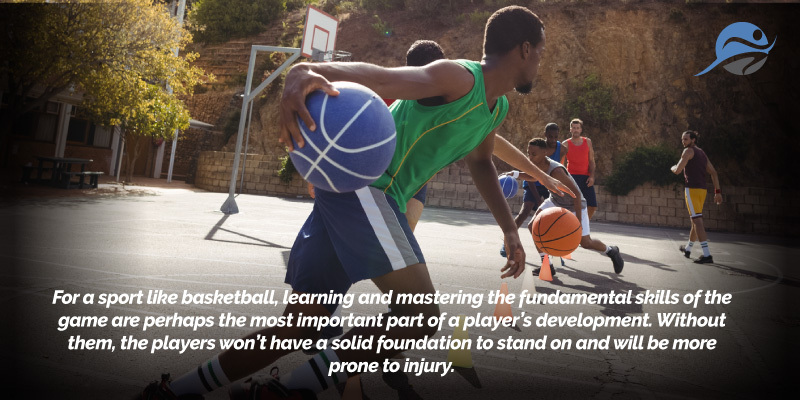 For a sport like basketball, learning and mastering the fundamental skills of the game are perhaps the most important part of a player’s development. Without them, the players won’t have a solid foundation to stand on and will be more prone to injury. As well, an emphasis on learning skills and practicing fundamental basketball drills will keep the players’ heads in the right space. There will be more emphasis on playing a good game than winning. Mastering basic skills will only increase your team’s chances at winning in the first place. These drills shouldn’t be solely about how to play the game, but also about learning when to put the skills to use. Your best bet as a coach is to put the skills into context so that the players know when to utilize each one and why. Emphasize both physical and mental aspects of the skill you’re focusing on for that specific practice, and your players will be better prepared to use the skills when it comes to game time. For younger players, be sure to keep the drills at ten minutes or less in order to hold their attention. And remember, older players need to practice basic skills too, particularly if they’ve adopted sloppy habits earlier on. As we stated above, strategy should come second to skills. However, it’s important to put the skills into context and teach the players when each skill should be used and in what circumstance throughout a game. Again, if your players don’t know the basic offensive drills, strategy won’t help them. Scrimmages will help your players put the skills they’ve learned into practice. They’ll also learn how to deal with loss and defeat, as well as victory. Practice games will help them develop decision-making skills and emphasize the fundamental positions of each player — you should make sure to move the players around so that they learn how each different position functions. Engaging in scrimmages is not only fun for the players, it often creates unique circumstances that force them to use problem-solving skills. Lastly, scrimmages allow players to be in a game setting so that they can get used to the energy of real games. Don’t forget the cool down! A proper cool down will prevent muscle soreness as well as injury. It’s a crucial part of a good practice, and should always be included in a practice plan. As long as you follow these simple rules, you should be able to make the most out of your practices and get the best and most comprehensive performance out of your players.